Nurses across the University of California system are striking this week to support janitors, technicians and other hospital workers demanding higher wages and better health care. Nurses across the University of California system are striking this week to support janitors, technicians and other hospital workers demanding higher wages and better health care. But patients aren’t likely to notice much difference in care. 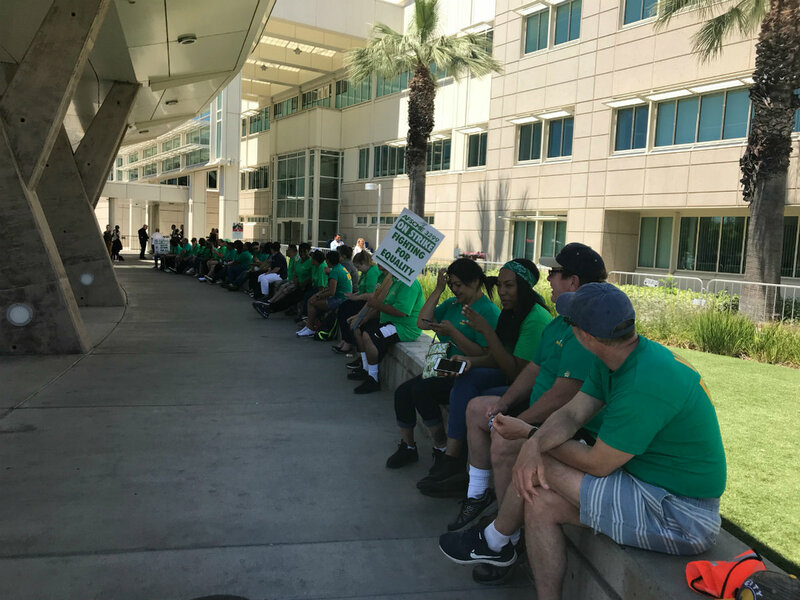 The California Nurses Association joined the strike at the UC Davis Medical Center on Tuesday, filing into the picket line with two workers’ unions that started a day earlier. The nurses are on what they call a “sympathy strike” to support their colleagues. The state has a thorough system in place for navigating disputes between public entities and their employees to ensure public safety. Felix De La Torre is general counsel for the California Public Employment Relations Board, which negotiates health care workers who can strike, and who are essential — meaning their absence from work would cause harm. When the department caught ear of the latest strike, De La Torre went to superior court on behalf of the UC. He said with public entities, it’s fairly common that critical staff can’t strike. “In most instances on the private side, with 10 days notice they’re able to replace all these essential employees,” he said. Unions are not required to give public sector employers 10 days notice about a strike, but they typically do, anyway, he added. “CNA is used to functioning in the private sector, and they believe it’s important to give the employer time to adequately replace workers so it doesn’t put anyone in harm’s way,” he said. At the UC Davis Medical Center, about 30 percent of facility staff are on strike. But hospital leadership said they were able to maintain normal hospital operations with careful planning. “Because so many staff have decided to come take care of patients, we were actually able to do more procedures than we anticipated yesterday,” said Chief Nursing Officer Toby Marsh. When union representatives gave notice about the strike, Marsh said the administration called in professionals and volunteers to fill in the gaps. They also rescheduled 769 procedures, either by operating before the strike or delaying until after. Same-day procedures that don’t need to be performed in a critical window tend to be easier to shuffle, he said. UC Davis oncology nurse Melissa Johnson-Camacho picketed on Tuesday and said she hopes her patients understand why she’s out on the sidewalk instead of inside the building. Striking is expected to continue through Wednesday. Thousands of custodians, security guards, gardeners and other service workers at University of California campuses started a three-day strike Monday to address pay inequalities and demand higher wages.